Tapestry Bellpulls and Butler-bells are a gorgeous addition to your home and fit perfectly in long thin areas. Every design is available as either a bellpull (denoted by prefix BP) or as a Butler-Bell (denoted by prefix BB). Please contact us if you wish to change the header when ordering. 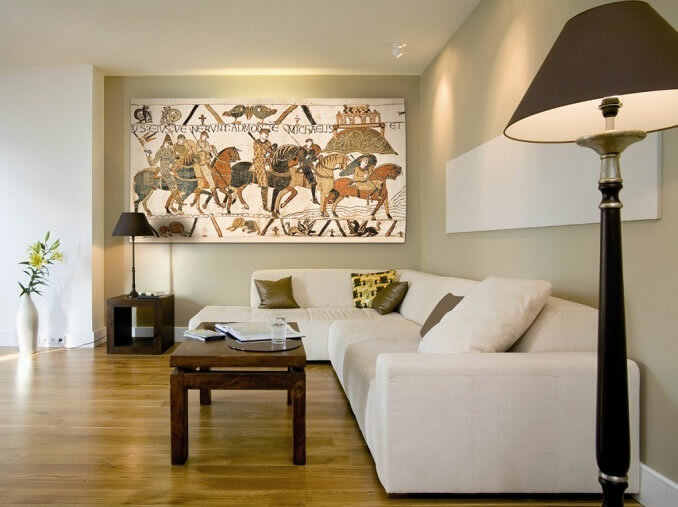 The Bayeux tapestry is a unique historical record depicting the events surrounding the Norman Conquest of England. The original tapestry now hangs at the Museum of Bayeux in northern France. A traditional bell pull from the Mille - Fleurs period from the 15th Century. This distinctive style thought to be inspired by the custom of strewing cut flowers on fete days in Medieval times.